New Patient Patients newly diagnosed with type 1 diabetes are seen immediately (no wait time). Patients newly diagnosed with type 2 diabetes complete DESMOND and are typically seen in clinic within 3 months. Advice on other social issues, e.g., driving, travelling, contraception etc. Team Members involved: Consultant, Specialist Registrar, Nurses/ Diabetes Nurse Specialists, Dieticians, Retinal Screener, Podiatrists, Senior House Officers, Ophthalmologist, Psychologist (referral-based service). Time: 1st Tues of each month from 8am-1pm. Annual Review Patients with stable, well controlled type 2 diabetes are seen once a year for a comprehensive diabetic review of kidneys, eyes, feet and diabetic control/ management. Care and support provided by educators following completion of structured education programme, DESMOND. Team Members involved: Consultant, Specialist Registrar, Nurses/ Diabetes Nurse Specialists, Dieticians, Retinal Screener, Podiatrists, Educators, Senior House Officers. Times: 1st Wed of each month from 9am-1pm. 1st Wed of each month from 2pm-5pm. 4th Tues of each month from 8am-1pm. TransitionA transition process begins at 16 years of age where adolescents are seen alone in the paediatric context, with the parent(s)/guardian(s) attending only at end of consultation. The transition process is discussed with patient in the year leading to the move to adult service. In their final year of school patients with type 1 diabetes attend two Transition Clinics, one in the Paediatric setting in the Spring and the second in the Adult Centre in the Autumn. Clinics are delivered by both members of the Paediatric and Adult service, it includes a visit to the Adult Diabetes Centre and aims to prepare young people for the move into this service. Team Members involved: Paediatric Consultant, Diabetes Consultant, Diabetes Nurse Specialist/ Advanced Nurse Practitioner, Paediatric Nurse. Young AdultSpecifically for adults aged 18-30 years old with type 1 diabetes. Patients typically transition to this clinic from Paediatric services after their Leaving Certificate. Major focus of this clinic is the implementation of intensive insulin regimens through DAFNE (structured education programme) and the appropriate use of insulin pumps and new technologies (e.g., continuous blood glucose monitors). Care and support provided by educators following completing structured education programme, DAFNE. Advice on other social issues, e.g., driving, travelling, contraception etc. Team Members involved: Consultant, Diabetes Nurse Specialists, Dieticians, Retinal Screener, Podiatrists, Psychologist (referral-based service), Educators	. Times: 2nd Wed of each month from 9am-1pm. DAFNE Review Special educator-led DAFNE Review Clinics are held in addition to routine clinic visits for all patients with type 1 diabetes who have completed DAFNE. Patients are identified in routine clinics who could benefit from dedicated follow-up support from the educator team. Initial clinic slots are half an hour and are held with the patient and both the Diabetes Nurse Specialist educator and Diabetes Dietician educator. Team Members involved: Diabetes Nurse Specialist educator, Diabetes Dietician educator. Times:2nd Thurs of each month from 8am-12pm. Diabetic Nephropathy Combined clinic between Nephrology and Diabetes specialists for patients complicated by kidney disease (diabetic nephropathy). Staffed by renal and diabetes consultants. Time: 3rd Wed of each month from 2pm-5pm. Get To Target Clinic Focus on the prevention of diabetes complications. Ensure patients reach targets (glucose, blood pressure and cholesterol). Team Members involved: Diabetes Consultant, Specialist Registrar, Nurses. Time: 1st Tues of each month from 8am-1pm. 2nd Tues of each month, 8am-1pm. Complicated Diabetes For patients with complicated medical problems related to their diabetes. Team Members involved: Diabetes Consultant, Specialist Registrar, Diabetes Nurse Specialist, Dieticians, Retinal Screener, Podiatrists, Psychologists, Senior House Officers, Educators. Time: 2nd Tues of each month from 8am-1pm. Type 1 and Insulin Pump Patients with type 1 diabetes of all ages who have not developed complications. Team Members involved: Diabetes Consultant, Specialist Registrar, Diabetes Nurse Specialist, Dieticians, Retinal Screener, Podiatrists, Psychologists, Senior House Officers. Times: 3rd Tues of each month from 8am-1pm. 4th Wed of each month from 9am-1pm. Diabetes Foot Where foot problems are detected in routine clinics a referral is made to the Podiatrist for assessment. Specialise in foot care and prevention/ worsening of foot problems. Team Members involved: Podiatrist, Diabetes Consultant (where appropriate), Vascular team (where appropriate). Times: 2nd Thurs of each month from 9am-2pm. 3rd Thurs of each month from 9am-2pm. Diabetes Pregnancy Care of diabetes women during pregnancy. No wait time. Team Members involved:Diabetes Consultant, Obstetric Consultant, Nurse, Dietician, Specialist Midwife. Time: Every 2nd Wed from 8:30am-1pm. Pre-pregnancyAim is to optimise diabetes control prior to pregnancy, initiation of folic acid and medication review (some may not be safe in pregnancy). Team Members involved: Diabetes Consultant, Nurse, Dietician. Time: Every 2nd Thurs from 2pm-5pm. Bariatric MedicineAssessing appropriateness of patients for bariatric surgery and preparing them for surgery. Intensive weight management programme (approx 1,200 calories a day supported by a nurse and dietician). Croí Clann Programme for the management of severe obesity in an intensive 10-week programme. Team Members involved: Diabetes Consultant, Nurse, Dietician, Psychologist (referral-based service), Surgeon, Cardiovascular Nurse (Croí), Physiotherapist (Croí) . Times: 1st Friday of each month from 8am-1pm. 3rd Friday of each month from 8am-1pm. Monogenic Diabetes (MODY) Maturity onset diabetes of the young is a genetic form of diabetes that is often misdiagnosed as type 1 or type 2 diabetes. Identify and diagnose patients correctly with the appropriate treatment changes and follow-up care. Team Members involved: Consultant, Diabetes Nurse Specialist. University Hospital Galway is located at the junction of University Road and Newcastle Road. The Endocrinology and Diabetes Centre is located towards the back of the hospital campus. There is a Bank of Ireland banklink machine in the main hospital lobby. There is a café and a shop in the main hospital lobby (open daily 7am – 8pm). There is a canteen in the Nurses Home, directly opposite the main hospital building. Just outside the main hospital entrance are many restaurants and cafés. There is a Tesco Express, Londis, Ulster Bank, a pub and a florist. There is a chapel in the hospital grounds and people are free to visit for private prayer. Pastoral care is available. There are also daily masses at 1:05pm, Monday to Friday, 8:30pm on Saturdays and 8:00am and 9:00am on Sundays. The Chaplains will contact religious and spiritual groups for any patients of other faiths. Generally no, patients that are referred to our service by GPs or from out-of-area are not invited to visit the clinic prior to their first visit. However, if a patient was interested in arranging such a visit we would urge them to contact the Nurse Helpline on 091-544698. 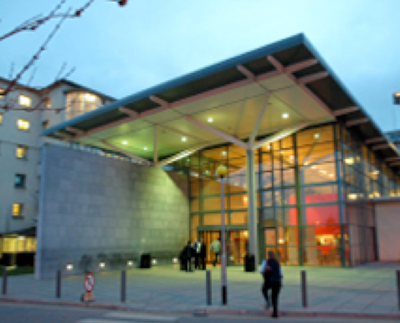 Patients transitioning from Paediatrics, in Galway University Hospital, will have the opportunity to visit the Adult Diabetes Centre prior to their first clinic and may already attend here for Retinal Screening. Reception staff will welcome the young person and book them in. They will be asked to wait in the Waiting Room until they are called by the nursing team. Where possible a Diabetes Nurse Specialist (sometimes it may be a Staff Nurse) will meet them in the Waiting Room and show them into the Pre-assessment Room where she will take their history and carry out some tests and measurements e.g., urine, height, weight, check injection sites. If a specific education need is identified and where clinic time and staffing levels allow, the Diabetes Nurse Specialist will bring the young person into a private room for one-to-one education. However, the young person is frequently scheduled for one-to-one education with the nurse at a later date. The young person returns to the Waiting Room. The Doctor is the next person who the young person will see in a one-to-one consultation. The doctor will do a full exam and assess treatments and medications. It may involve examining the young person’s feet. During the young person’s first visit to the Diabetes Centre they will always see the Consultant, so if the Consultant was not the examining doctor they will then wait to meet with the Consultant. If eye screening is required they will wait to see the Retinal screener. If they wish to see the Dietician this is typically the next person they see. The nurse will explain to them what DAFNE is and put them on the DAFNE Waiting List if they wish. The nurse will also provide the young person with support and emergency numbers for the Diabetes Centre. If no bloods were taken prior to clinic the nurse will give the young person a Blood Form and ask them to present over to Phlebotomy Rooms to have their bloods taken in the Outpatients Department (located across the car park). Ideally, bloods should be taken prior to clinic by either the young person’s GP or by taking a Blood Form to Phlebotomy Rooms in the Outpatients Department. Reception staff will indicate the next clinic date and a letter to their GP will follow within a few days. If the young person has transitioned from the Paediatric Department in University Hospital Galway, Diabetes Centre staff will have their chart. If the person is referred from elsewhere we will only have the referral letter, e.g., GP referral letter, and no other information. Please note that even if the referral comes from another HSE hospital, the Diabetes Centre in Galway does not have access to the patient’s chart. Young people are invited to attend the Young Adult Type 1 Diabetes Clinic approximately every 3 months. All other adults with type 1 diabetes typically attend the Diabetes Centre every 6 months. In general young adults with see the same Diabetes Nurse Specialist and other staff nurses. Except in very rare cases the same two Consultants are at all Young Adult Clinics. Some Non-consultant House Doctors such as Specialist Registrars (every year) and Senior House Officers (every 3 months) are likely to change as is the nature of university teaching hospitals. Young Adult Clinics are scheduled every second Wednesday of every month, with two clinics running that day (9-1pm and 2-5pm). If a young adult knows they cannot make their scheduled appointment they are asked to inform the Diabetes Centre as soon as possible so they can be rescheduled at the next available clinic (usually the following month). There is no problem rescheduling to see the nurse at any stage, just ring the Nurse Helpline on 091-544698. The Diabetes Centre aims to be as accommodating as possible to young adults and will fit patients into other clinics, e.g., to coincide with other hospital appointments or college times. Unfortunately, young adults should note that other clinics are often busier with more patients so the wait time can be more than in Young Adult Clinics. Young adults are seen every 3 months and receive approximately 3 months notice. They also receive a remind text message 48 hours before their clinic appointment. Helen Burke, Advanced Nurse Practitioner, Diabetes Centre, University Hospital Galway. Helen can be contacted via the Nurse Helpline on 091-544698. Please note that unlike some Paediatric Departments there is no Point-of-care HbA1c machine in the Diabetes Centre and therefore, young adults are strongly advised to have their bloods done prior to their clinic visit. Young adults are encouraged to bring all their diabetes appliances (meters, pens etc.) and medicines to clinics with them, this helps to get the most benefit out of clinic visit. Bring something to read or do for the Waiting Room to help pass the time. Unfortunately, there is no WiFi access in the Diabetes Centre.